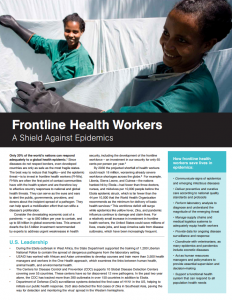 March/April 2017 Frontline health workers save lives and improve the health of millions across the globe. Find out more about their impact on some of the US Government's global health priority areas. Greater investment the frontline health workforce in low- and middle-income countries (LMICs), coupled with policy changes to address critical barriers women in the health workforce face, holds massive potential for women’s economic empowerment, both for health workers themselves and the communities they serve. 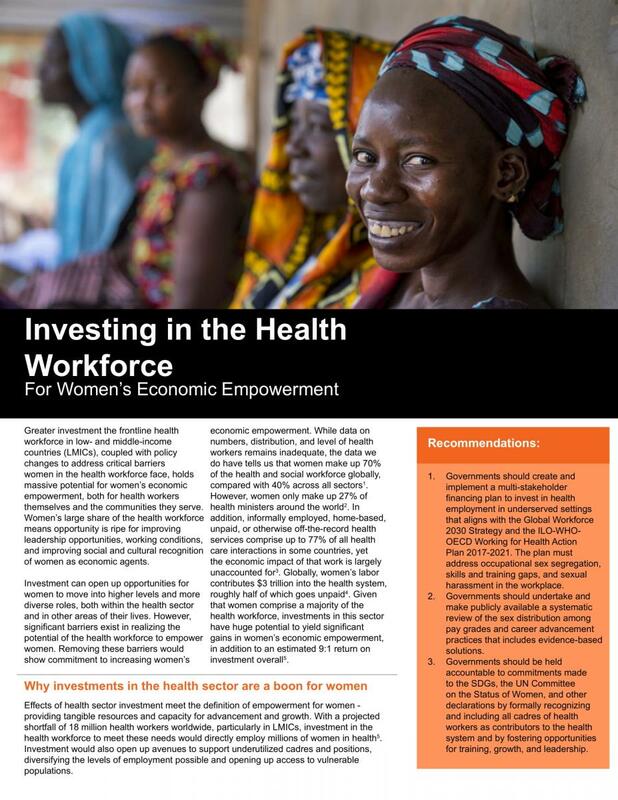 Women’s large share of the health workforce means opportunity is ripe for improving leadership opportunities, working conditions, and improving social and cultural recognition of women as economic agents. 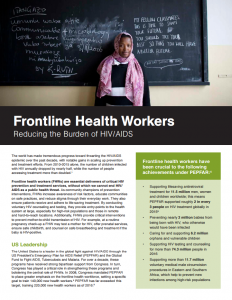 Frontline health workers are essential deliverers of critical HIV prevention and treatment services, without which we cannot end HIV/AIDS as a public health threat. As community champions of prevention interventions, FHWs increase awareness of risk factors, educate communities on safe practices, and reduce stigma through their everyday work. However, the current pace of progress on building a strong health workforce will fall well short of what’s needed by 2030; estimates suggest the world will be short 18 million health workers by 2030 in countries with the greatest need if we maintain current trends. This severe shortage of health workers will hit African countries the hardest – a region that makes up 75% of the global burden of HIV/AIDS. To bring the world closer to the end of HIV/AIDS, the United States government must increase its support for frontline health workers while maximizing the impact of existing support. Since diseases do not respect borders, even developed countries are only as safe as the most fragile states. The best way to reduce that fragility—and the epidemic threat—is to invest in FHWs. FHWs are often the first point of contact communities have with the health system and are therefore key to effective country responses to national and global health threats. They can help spark a mobilization effort that can stifle a disease’s proliferation. However, by 2030 the projected shortfall of health workers could reach 18 million, worsening already severe workforce shortages across the globe. The United States should release a multi-year, costed, cross-agency strategy or action plan for enhanced U.S. support to assist partner countries in strengthening their frontline health workforce throughout the labor cycle, including financing plans for health emergencies such as improving hazardous duty pay and family insurance options; providing personal protective equipment and adequate supplies and medicine; and recognizing health workers’ heroism during emergency responses to curb the stigma and violence regularly directed at them. 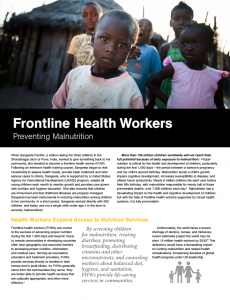 Frontline health workers are crucial to the success of advancing proper nutrition during the first 1,000 days and beyond. Rural or remote communities in developing countries often face geographic and economic barriers to accessing proper nutrition, information, and medical care. Serving as counselors, educators and treatment providers, FHWs provide services directly to families in their homes and in local clinics. Unfortunately, the world faces a severe shortage of doctors, nurses, and midwives; recent estimates project the world may be short 18 million health workers by 2030. This defciency would have a devastating impact on curbing malnutrition and related health complications, threatening decades of global health progress under US leadership. To accelerate progress toward eliminating malnutrition, the US government should develop and implement a coordinated and comprehensive health workforce strategy or action plan that outlines how it will contribute to strengthening the global health workforce to provide nutrition-related and other essential health services.